Gentleman, mark your calendars. If she asks, you’re busy that day. Which day am I talking about is irrelevant, just trust me. 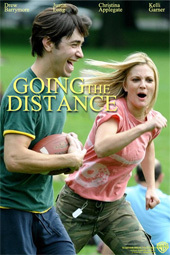 I am simply trying to help you avoid the long-distance romcom Going the Distance, starring Drew Barrymore and “I’m a Mac” Justin Long. Geez, they’re even holding the eye candy out in this one! The movie looks painful. We’ve already seen it 100 times over. But for some reason, your girlfriend thinks it looks “cute.” Perhaps it’s because D-Bar has fooled the world into thinking she’s the girl next door. And I guess she is, if your girl next door is the offspring of a stage and screen dynasty who were rich before every Hollywood player was rich. Or maybe it’s because Drew and Justin are an off-screen item. Whatever the reason, you must get out of this one. Christina Applegate, Jason Sudeikis of SNL (He’s an A-Hole) and Office Space alum Ron Livingston (I’m Sorry. I Can’t. Don’t hate me.) round out the cast. Am I being to harsh? Decide for yourself. And remember that on opening day, August 27th, 2010, you already have plans. Lol! Looks like this is a romantic comedy. I love Drew… heheheh. “Drew, why don’t you Get Him to the Greek”Hehehhe, just kidding. This movie of Russell Brand, Diddy and Jonah Hill is super fun. Premieres already coming out -NYC, Miami and Atlanta. I’m just glad my girlfriend doesn’t watch romantic comedies. The worst thing I have to worry about is going to see a somewhat terrible science-fiction or horror flick with her which, let’s face it, I would probably be seeing anyway.